Over the past months, we have featured many projects of #GenXYZ that improve the quality of lives in regions less developed. Thanks to txtMD.xyz, people in rural areas can receive free access to healthcare and help prevent epidemics from spreading. LearningOnline.xyz provides a unique language learning ecosystem and Engine.xyz helps entrepreneurs getting access to MIT’s exceptional facilities. This week’s #WebsiteWednesday has secured over $70,000 in funding to bring the first home service marketplace to Bangladesh: Sheba.xyz. 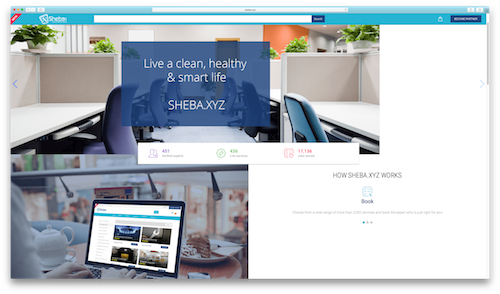 Sheba.xyz is an online home service platform that allows customers to find qualified experts for any job they might need done around their house and beyond. Sheba.xyz lets users order professional home services such as cleaning, relocation, rennovation, and computer-related services with just a few clicks. Sheba.xyz relies on a network of highly trained service professionals, each experts in their field. Being among the first to this market in Bangladesh, Sheba.xyz earned an invitation to SD Asia’s Innovation Xtreme event, where they were awarded a BizSpark/Youth Spark funding package from Microsoft, Facebook, and others. SD Asia also selected Sheba.xyz to participate in their GP Accelerator’s inaugural program, earning them a seed fund investment, access to the GP workplace, and mentorship. Sheba.xyz was also listed among SD Asia’s ‘Top Six Startups of IX 2016′, featured as one of the ‘5 Bangladeshi Startups to Follow’ by BDESH, and have a solid 5 star rating of their app in the Google Play Store. “Our vision is to be the leading Service Platform at a local and international level. We want to move beyond making profit only and improve lives in Bangladesh. By 2018, our aim is to create 10,000 new jobs in Bangladesh. By 2021, Sheba.xyz will develop into a global company with operations in at least four countries. Job creation and helping professionals connect with new clients in a young market economy like the Bangladeshi one, is an exciting goal. Sheba.xyz is another excellent showcase of #GenXYZ’s power to innovate. Starting your business on a .xyz name will signal to your clients, employees, investors and stakeholders: you will make a difference!